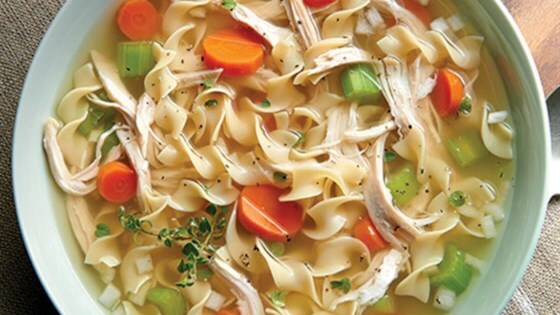 "Flavorful herbs, fresh vegetables and NO YOLKS® Noodles make this homemade chicken noodle soup an all-time favorite." Heat oil in a large pot over medium heat. Add garlic and onions and saute 2 minutes. Add carrots, celery, bay leaves, thyme, chicken and broth. Bring to a boil. Add noodles. Reduce heat to medium and simmer 10 minutes. Remove bay leaves and thyme sprigs. Season with salt and pepper to taste. *1 rotisserie chicken yields about 4 cups meat. Easy but Kinda bland for me. I'll try again but simmer the broth longer. I followed the recipe exactly, and it turned out perfectly! Our family of four enjoyed this soup for lunches over a few days of "at home sick time". Perfect comfort food! This is very close to my go to chicken noodle soup recipe, so with that being said we loved it, quick and easy. Loved the ease of this recipe and really enjoyed the flavors. Noodles from No Yolks held up really well, even on reheating! A keeper. LOVED IT!!! SO delicious! The only thing I did differently was I added two potatoes (diced small) and I used the No Egg whole wheat noodles. OMG so yummy!!!! !